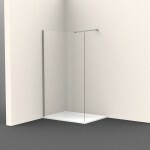 Frameless and reversible side panel for walk-in enclosure, 30 cm, with anti-limescale 8 mm Easyclean safety glass. Chromed aluminium wall profile and fixation set included. Frameless and reversible fixed panel for walk-in enclosure, 90 cm, with anti-limescale 8 mm Easyclean safety glass. Chromed aluminium wall profile, 1200 mm stabilising bar and fixation set included. Frameless and reversible decorated fixed panel for walk-in enclosure, 90 cm, with anti-limescale 8 mm Easyclean safety glass. Chromed aluminium wall profile, 1200 mm stabilising bar and fixation set included. Frameless and reversible fixed panel for walk-in enclosure, 100 cm, with anti-limescale 8 mm Easyclean safety glass. Chromed aluminium wall profile, 1200 mm stabilising bar and fixation set included. Frameless and reversible decorated fixed panel for walk-in enclosure, 100 cm, with anti-limescale 8 mm Easyclean safety glass. Chromed aluminium wall profile, 1200 mm stabilising bar and fixation set included. Frameless and reversible fixed panel for walk-in enclosure, 120 cm, with anti-limescale 8 mm Easyclean safety glass. Chromed aluminium wall profile, 1200 mm stabilising bar and fixation set included. Frameless and reversible decorated fixed panel for walk-in enclosure, 120 cm, with anti-limescale 8 mm Easyclean safety glass. Chromed aluminium wall profile, 1200 mm stabilising bar and fixation set included. Frameless and reversible fixed panel for walk-in enclosure, 140 cm, with anti-limescale 8 mm Easyclean safety glass. Chromed aluminium wall profile, 1200 mm stabilising bar and fixation set included. Frameless and reversible decorated fixed panel for walk-in enclosure, 140 cm, with anti-limescale 8 mm Easyclean safety glass. Chromed aluminium wall profile, 1200 mm stabilising bar and fixation set included. Frameless and reversible fixed panel for walk-in enclosure, 160 cm, with anti-limescale 8 mm Easyclean safety glass. Chromed aluminium wall profile, 1200 mm stabilising bar and fixation set included. Frameless and reversible decorated fixed panel for walk-in enclosure, 160 cm, with anti-limescale 8 mm Easyclean safety glass. Chromed aluminium wall profile, 1200 mm stabilising bar and fixation set included. Frameless and reversible fixed panel for walk-in enclosure, 180 cm, with anti-limescale 8 mm Easyclean safety glass. Chromed aluminium wall profile, 1200 mm stabilising bar and fixation set included. Frameless and reversible decorated fixed panel for walk-in enclosure, 180 cm, with anti-limescale 8 mm Easyclean safety glass. Chromed aluminium wall profile, 1200 mm stabilising bar and fixation set included.